Wufoo deserves a spot on this list because of its beginner-friendly nature, more varied payment options, and range of 3rd party integrations. It’s managed to take the tedium out of form building thanks to the drag-and-drop design – in fact, it’s actually fun to build forms with Wufoo. It has an extensive DIY support section with video tutorials, e-mail support, user forums, and blog, so you can diagnose and fix any problems with the help of the archived articles and user community. Wufoo is an established form creator, launched in 2006. Over the years, Wufoo has built the simplest, straight forward and most user-friendly course to create a form. 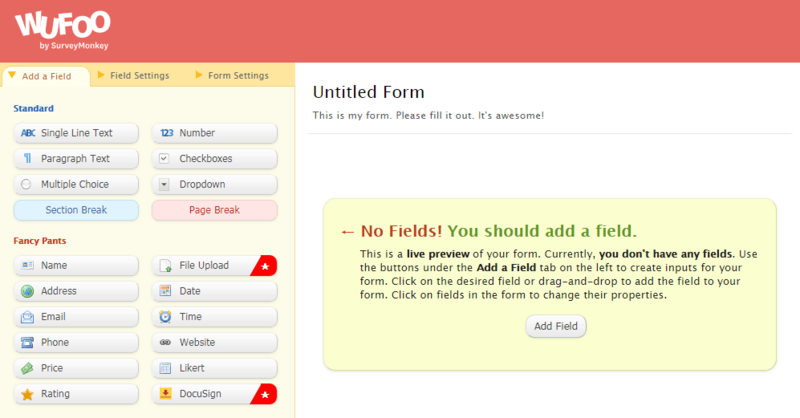 With lots of templates, Wufoo has implemented a fun way to create a form. The forms on offer provide basic functionality and features, so you cannot get lost amidst hundreds of advanced features and complicated tools. It’s an easy, clear system offering 7 different types of forms. If you are a beginner, then WuFoo is ideal for you! Wufoo’s exquisitely designed Form Gallery is fun to navigate and find the perfect form template for you! 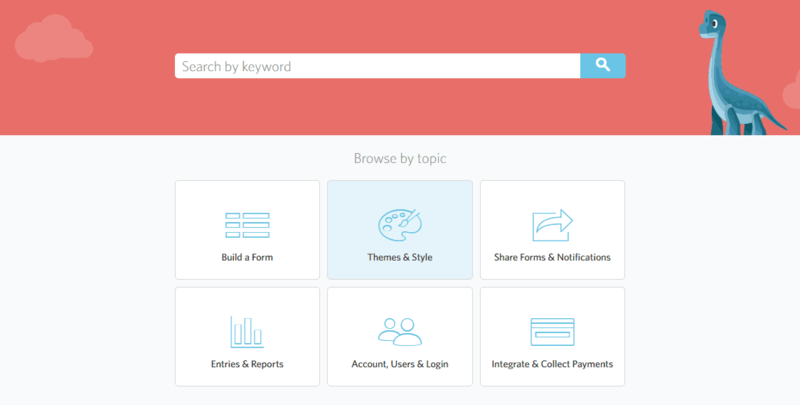 Template Selection: Wufoo has 7 different types of forms and over 120 templates. Click on Surveys, for example, and find a list of 26 specific types of surveys. Customization: All the templates are customizable at the click of a mouse. In addition, the forms’ general theme and colors can be easily modified. Wufoo has a number of fantastic features, such as live reporting, file uploads, and popular software integrations. However, a majority are only available for paid accounts. Nothing is more confusing than creating a form, with a large amount of icons, features and tools popping up your way. With WuFoo this is not a problem because the form creator is absolutely clutter free. Create a simple, basic and effective form without the stress and confusion. The fun and goofy approach certainly makes a good impression and makes you feel like creating a form is fun…no drab and dull images here. In the Form Builder you can choose from a bunch of the most popular input fields and create one from scratch. But most will find the easiest thing to do is find a model in the Gallery, click on “Add To Wufoo” and modify from there. There are many ways to integrate your form such as iframe, popup, or separate html file. Wufoo easily integrates with Facebook and MailChimp. Wufoo has an extensive section called Wufoo Docs that is searchable and has tons of images and videos to help explain everything in an easy-to-understand step-by-step process. There is even a Video Tour section, where you can easily access many videos. Active Support forums are available, and you can email support whether registered or not. There is no option for chat or phone. Once you get hooked on Wufoo, the limits set on free accounts, allowing for a maximum of 3 forms and 10 fields will seem rigid. The next level plan, Starter goes up to $19 and includes 10 forms per month. From there, pricing plans escalate up to $99 per month, on offer for true power users. Wufoo is a user-friendly way to discover the world of form building. You will easily apply and enjoy the power of its many features. Plans start at free forever, on an ascending scale up to about $100 per month. If you need forms, we highly recommend Wufoo for an enjoyable experience. Get started and build your first form today! We are almost certain you will get quickly hooked. Click here to try Wufoo.